Leaves: Basal, odd-pinnately compound, 1.6 to 12 inches long; leaflets 7-25, opposite or scattered, narrowly lanceolate or elliptic to ovate-oblong, .2 to 1.6 inches long, 1/12 to 2.5 inch wide, silky-hairy; tip pointed or blunt; stalk 1/5 to 6 inches long; stipules 1/3 to 1 inch long, fused to stalk for 1/2 length or more. Inflorescences: Raceme, 6-30-flowered; flowering stalk 2-12 inches long, silky-hairy. Flowers: Calyx tube bell-shaped, 1/3 to 1/2 inch long, with stiff, soft or spreading white or black hairs; calyx teeth 5, unequal, 1/12 to 1/5 inch long; corolla papilionaceous, white or cream, fading yellowish, keel tip often purple; banner 3/5 to 1 inch long, deeply lobed or notched; wings 3/5 to 4/5 inch long; keel 1/2 to 3/4 inch long; stamens 10, in two groups, enclosed in keel. Fruits: Pod, erect, sessile, oblong, 2/5 to 1 inch long, 1/6 to 1/3 inch in diameter, silky-hairy or somewhat short-hairy; beak short; seeds 1/12 to 1/10 inch long, smooth, brown. Habitat: Rocky prairies, plains, hillsides, gravelly banks, open wooded hillsides. Toxicity: Poisonous to livestock. 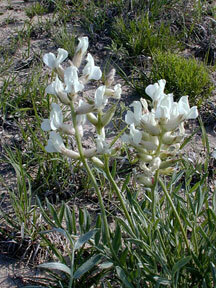 Animals develop a preference for Oxytropis after consuming it and will seek it out. It is associated with neurologic problems with symptoms that include depression, weight loss, lack or coordination, and a stiff gait. Affected horses may become violent when restrained and sheep demonstrate a loss of their flocking instinct. Uses: Native Americans applied an infusion of leaves to sores and used it to treat ear disorders. Children would sometimes make headresses from the stalks. Comments: Tufted. Know to hybridize with purple locoweed Oxytropis lambertii. From Greek oxys "sharp" and tropis "keel" in reference to the beaked keels and Latin sericus "of or pertaining to silk" in reference to the its silky pubescence.